It all began with two sisters wanting to do "something" together! Sisters Robin and Cathy grew up in the small town of Mount Airy, North Carolina. 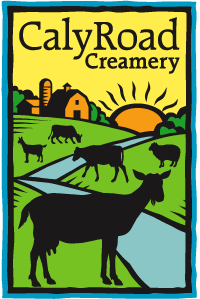 "We always knew we wanted to do something in the agriculture field, but we had not idea it would lead into the food business," says owner of CalyRoad Creamery, Robin Schick. Schick was formally trained at the Vermont Insititute of Artisan Cheese. We had the good fortune of meeting the lovely ladies of CalyRoad last weekend. Besides Robin, team CalyRoad consists of Tina Engberg, Sylvia, Susan and Powell. After breaking ground in Atlanta in 2009, CalyRoad Creamery will have opened officially at their Sandy Springs location two years ago this coming April. "Sandy Springs has been wonderful to us. Fabulous, actually!," says Schick. "We have built a nice name here by word of mouth in the community." The farmer's markets across the metro Atlanta area are CalyRoad's biggest customer base. Many high-end Atlanta area restaurants carry the CalyRoad cheeses including: Star Provisions, Ecco, Holeman and Finch, Miller Union, Restaurant Eugene, Watershed, Canoe, Muss and Turners and recently, The Stout Brothers Growler Store in Smyrna. The most popular of all their cheeses is the WayPoint, a classic, creamy and buttery cheese and the Red Top Smokey Paprika is their most recent "up and comer." The Red Top is an aged goat. We first sampled CalyRoad at The Atlanta Food and Wine Festival in 2012 and instantly fell in love! After sampling the CalyRoad cheeses on restaurant menus that we started to frequent around Atlanta, we knew that we had to interview these special cheese artisans. As we drove to the CalyRoad location, we were envisioning the store to be a huge warehouse. To our surprise, CalyRoad is a small. quaint store with unique southern charm. CalyRoad works with Jacqueline Chambliss, who is one of seven French Wine Scholars in Georgia, studying for her Master of Wine designation to pair their cheeses and wines together. 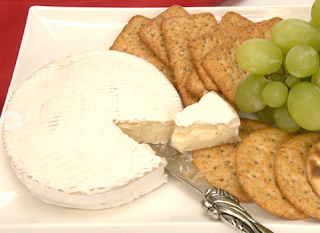 Most of the CalyRoad cheeses pair nicely with white wines: Riesling, Viogner, Sancerre and a Pinor Noir (red). To learn more about Jacqueline, https://www.facebook.com/TheEuropeanWineTableGourmetWineJelly. Monday-Friday 10am-5pm and Saturday 10am-1pm. Mediterranean Feta: Brined cheese aged a minimum of three weeks. Our Feta us a great cheese to add to salads, baked fish and grilled vegetables! Little Epiphany (aged cow): Crottin-style aged cow perfect as an appetizer for two. Sharp and sour notes make this little cheese a perfect small bite paired with fruit, balsamic reduction or a peach jam. The more this ages the better it is! Each cheese is 3-4ounces. Big Bloomy (aged goat): Aged in house, we call this little beauty “Big Bloomy” for its soft white rind and delicate looking shape. Don’t be fooled though…there’s a very BIG taste inside!! Four ounce cheeses wrapped in specialty cheese paper. Little Stone Mountain (aged goat with ash): Another in house aged goat cheese with a bloomy rind combined with a dusting of ash. It is a perfect summer cheese which goes well with a crisp, cold white wine. It reminds us of Georgia’s distant Stone Mountain on the horizon, east of the city. Four ounces wrapped in a specialty cheese paper. Red Top (aged goat with smoked paprika): This in house aged goat cheese features a dusting of smoked paprika before it develops a bloomy rind. The smoky paprika lends a distinctive flavor to the aged goat cheese, making it a welcome addition to any cheese platter. Red Top is named affectionately after Red Top Mountain outside of Cartersville. Four ounces wrapped in a specialty cheese paper.